The title comes from the “World Wide Mind” project (see w2mind.org). How this project comes up and how it relates to the work of TGS, Inc. deserves some attention (see below). As an aside, I have already mentioned truth engineering in the context of our intent. Too, referring to the w2mind project can help bring out for discussion some of the nuances suggested by writing of the metaphor(s) (as I see them) of Facebook. Aside: Genealogy, and related historical views, will continue to have a growing technical flavor. As such, there are (will be) issues that need to be attended to. The first step is recognizing the need; this blog will have such a requirement (which will be, hopefully, more clear as we proceed). Putting the head in the sand is not the way to go (as some seem to have done). Okay, now to the rest of the story. I first ran across Mark Humphrys’ work some time ago. To date, I mostly just looked at relationships that he documented as these popped up when I was doing queries. Then, I found his famous people work to be interesting (see Kinnexions, too) and have looked at the lines that he provides from time to time. Notice that he incorporates the work of others. Today, I noticed the support request and followed down the links to the contact page. I noticed that he provided his professional page. That is where I found the w2mind work mentioned. Too, his original proposal was in 2001. My start of the truth engineering work was 2000. The common theme is AI (which is a broad in scope but ought to be on everyone’s radar in some way or another – these systems that are being provided free are laden with features based upon techniques that have evolved from the work of a whole lot people or a long period of time). Mark has been on the Internet since 1987 (I remember doing protocols/logic back in the earlier part of the 80s). But, Mark also mentions his history and genealogy work on his professional page which indicates that he has been at this for awhile (versus my six years – computing? for that, several decades). It is interesting that Mark has morphed a brick-wall into a competition (citizen science?). Now, his mention of several important subjects requires some attention. Say, on his page, his Turing Test and AI in general comments. Then, he goes into Computers and the Internet from which we see his thoughts on pre-IP usage (BITNET – all sorts of access methods were available before IP was let go so as to allow the wild west to emerge, again – which let DOD get bit a few times and by a few ways – sheesh). Finally, I like that he comes (came) to the defense of Wikipedia (my claim is being the oldest Wiki’an). All in all, there are lots of things to discuss; Thomas’ life (Backbone series) will be a central feature to a lot of discussion. But, too, technical experience will be grounded on ourselves (even when we have near-singularity – arguable point that needs attention), our historical natures, and phenomenal aspects yet to be defined such as to meet “objective” needs. Besides discussion, we at the TGS, Inc. consider research as central to our purpose, including, among a lot of other things, helping to scope how information/knowledge (of things related to our selves – many senses) can map to wise technocratic existence and better science as it pertains to human affairs. In short, a type of juxtaposition is necessary (convolution, to boot) in several domains. One issue, or the core thing, will involve a more proper (yes) perspective of humans and what they bring to the table (say, perhaps, motivated by reading Canfield – the soul soup guy – but by no means with his ideas as coach’d material – autodidact implies, in this case, mentor-free). 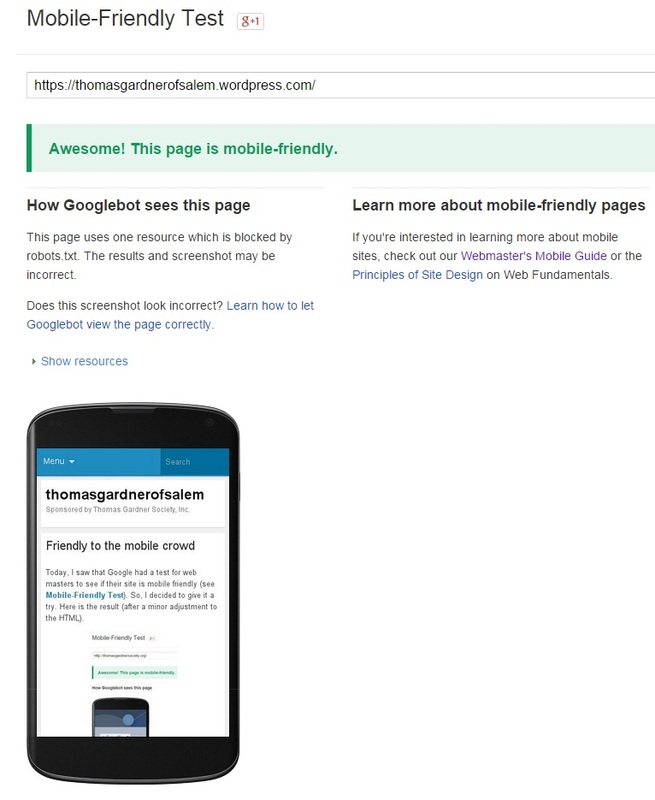 Today, I saw that Google had a test for web masters to see if their site is mobile friendly (see Mobile-Friendly Test). So, I decided to give it a try. Here is the result (after a minor adjustment to the HTML). So, the bot sees the site as mobile friendly (at least, the first page; that is, until I propagate the minor change). Well, I was happy to see that since I spent a little time last summer redoing the site using CSS. There are reasons for this, interim, choice. See the Content Management discussions. Even though I know about the growing mobile usage, I have not dropped into that realm (of people with their noses tied to a device as a bull is to a rope to its nose ring). What, pray tell, requires 24/7 attention that is more important than the reality in which we are embedded (thanks, managers, you, with your addiction to the Blackberry devices – which became a red badge of belonging’ness, importance and what not – we are talking almost two decade’s descent into idiocy). Well, let’s back up here. So, the TGS, Inc. site met this test. Yet, for several sites that I use, regularly, their conversion to mobile-friendly made the site unfriendly. Why? We can talk this as needed. Yes, I will get mobile here soon. God help me to refrain from the nose to the device stance that would be flattering if the content being seen were substantially deep (all sorts of interpretations here). Ever heard of mindfulness? One youngster said, that is not of this culture. But, esteemed schools are starting to add this into their study mix. To me, the device is more of an attention drain than not. But, then, who can stand in the way of progress? Our bit? Talk the truth engineering aspects and use Thomas/Margaret’s lives as a model from which to learn. Again, 04/25/2015 — Could not resist. This blog, itself, where I reported the mobile-friendliness of the main site is itself a mobile’s friend.